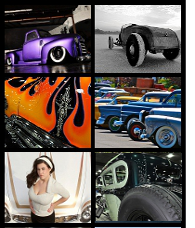 The Grand National Roadster Show is truly the “Grand-daddy of them all” when it comes to hot rod and custom car shows. 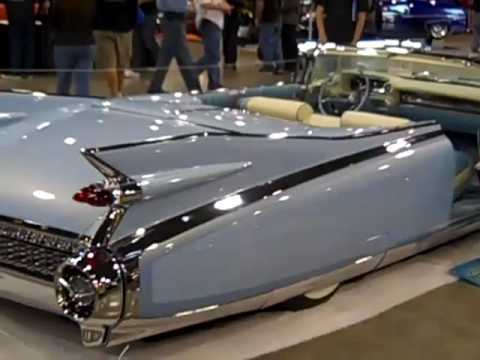 Where else would you find two super-custom 1959 Caddy’s? Finished to near perfection, take your pick of the “Custom Restoration” ’59 Cadillac (story here) or this latest 1959 Cadillac custom from D’Agostino. Put your hands together for “Elvis II” built for David E. Walters. Unlike the custom-restoration 1959, this is a true Biarritz. The full name is a mouthful: 1959 Cadillac Eldorado Biarritz convertible. Deserving the long name, the Biarritz marked the top of what was already a very expensive ($7401 in 1959) and extremely luxurious ride. With the 3×2, 345 horse Q-code Cad motor standard for the Eldorado, the options separating the Series 62 from the El-do include a host of cosmetic tricks in the grille, taillights and interior, but also include air ride from way back in the 50’s! What’s old is new as just about every custom you see these days is on air. Even with it’s superbo-delux-ness right from the General and limited 1320 production, I’m glad to see this custom example from D’Agostino. 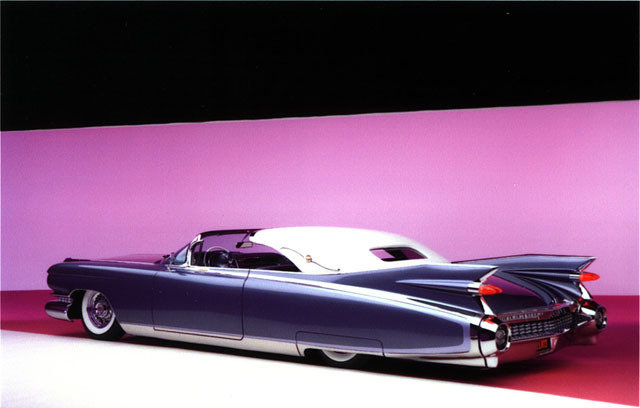 Elvis II’s journey started naturally with D’Agostino’s Elvis 1 custom creation, a 1959 Eldorado Seville Cabriolet shown here with the picture from http://www.johndagostinokustomkars.com. Elvis 1 had a busy social calendar like the King himself… Built and shown in 2006, Elvis 1 then spent time on tour in Europe and Australia before landing on the block at the Scottsdale Barrett Jackson auction in January of 2007. After selling for $280,000, the long Cad then spent about 6 months on display at the Peterson Museum. Here’s the video from Barrett Jackson showing a little more detail of the car and D’Agostino. After the being sold in Scottsdale, it was then up for sale again in August 2oo8 for RM’s Monterey Auction. Mr. Walters, already familiar with the car bid, but was outbid by a Paris bidder who as D’Agostino put it, “Had to have the car” to the tune of $320,000. Not discouraged, Walters responded by buying two Cadillac Eldorado Biarritz convertibles! A 1957 and 1959, that later became Elvis II. The car you see here was a low mileage, totally restored, original car with the last owner holding it for 30 years. What a history already! Even starting with a fully restored car, creating Elvis II’s build kicked off with D’Agostino stripping the car, then chopping the top and windshield 4 inches. He then fabricated custom wide side trim to accentuate the sweeping lines of the already elegant 59. Not satisfied with the original air suspension of the Eldorado, a new air ride system was installed to sit down over the D’Agostino customized wire wheels with soft bullet center. The front and back bumpers include 208 shining chrome bullets and make for great photo ops! The interior features Swedish white leather and blue calf skin details and a styled brocade blue insert. The carpet is Rolls Royce powder blue lambs wool. In the display, it was tough to take in all the interior details, but I snuck around the ropes and grabbed this photo. Phone in the front and liquor in the rear, right Elvis? (That’s just bad writing.) The top, not shown in any of these pictures is all white. Just visible in these photos is the custom made tonneau cover. Including all custom chrome trim, it’s amazing that with the unrestrained opulence shown by Cadillac designers in 1959, modern customizers can still leave their mark. The paint is a custom mixed House of Kolor creation called “Ice Blue” with a gold pearl highlight. Well known painter Art Himsl out of California has been laying down custom paint since the 50’s and did the honors here. I want to see this car outside so the gold pearl can do it’s thing. That’s the only bummer about GNRS. It’d be great to take the best of the best outside for more pictures. Whatever details I missed, you might catch them in this short video. I’ll leave you with this smile, matching my own after seeing this car and talking to a friendly John D’Agostino. These custom gold Cadillac emblems feature Swarovski crystals and even some diamonds and were, you guessed it, custom made. Speaking of thank you’s, thanks to John D’Agostino for the info and pictures. Make sure to check out D’Agostino’s website for more pictures of the cars he’s built. Among the great ones, this has to be one of his finest. We’d love to hear your impressions of Elvis II. As an interactive digital magazine, you have a chance to give immediate feedback! Why not do it? Craig… “THANK YOU” for the “AWESOME” photos of the “ELVIS II” 1959 Cadillac KUSTOM. It was nice to meet you at the G.N.R.S. We will display “ELVIS II” at the Petersen Museum in L.A. later this year before it leaves on a worldwide tour throughout EUROPE. Simply beautiful car named after the King himself, Elvis Presley. John D’Agostino’s kustoms are world-class.